The progress calculation is done based on engineering work steps and their weight factors for an engineering drawing. See the below sample work steps and weight factors. Weight factor is calculated based on effort required for each work step for a particular drawing/document. The ratio of weight factor for each work step could be different depending on your project team’s expert judgment. The following work steps are required to produce an engineering drawing as minimum. 3) 10% (0.10) of total hours for "Issue for Internal Review"
4) 10% (0.10) of total hours for "Issue to client"
5) 15% (0.15) of total hours for to get "Approval by Client"
6) 15% (0.15) of total hours for "Issue for construction"
The sum of total weight factors for all work steps must be 100% (1). Let’s find out how a piping drawing progress is calculated. Suppose a piping isometric drawing design has been completed 50% of “Study and Preparation” work step. See the details calculation and below figure for easy understanding. Therefore, the actual progress for that drawing up to 50% completion of study and preparation step is 27.5 %. The actual progress would be 50% when “Study/Preparation” work is completed 100%. Progress calculation for an engineering specification/requisition is done using the same exercise for engineering drawing. The only different is its work Step and weight factor as weight factor for each work step for each specification/requisition is required to calculate the quantity progress. The following are work steps and weight factors for a production of engineering specification/requisition. 2) 45% (0.45) of total hour for "Study and preparation" step. 3) 15% (0.15) of total hours for "Issue to client"
4) 20% (0.20) of total hours for to get "Approval by Client"
5) 15% (0.15) of total hours for "Issue for construction/Purchase” Once again, the sum of total weight factors for all work steps must be 100% (1). To calculate discipline wise (level-3) engineering progress, in other word, physical progress for an engineering discipline = the sum of the product of weight factor for each document and engineering progress (quantity) for each document. Weight factor calculation for engineering document is required to calculate engineering progress for each discipline. Engineering documents are normally categorized drawings, specifications, requisitions and information documents. P&ID drawings, isometric drawings, pump GA, foundation drawings, etc. are in drawing category. Material specification, equipment/piping fabrication and erection specification and Instrument cable specification are in specification category. REQ for piping material, REQ for pump/compressor/blower and etc. are in requisition category. Assume the budgeted man hour for an iso metric drawing is 200 and 10,000 hours for all piping documents. Therefore, weight factor for that iso drawing is (200/10,000) 0.02. Progress calculation for mechanical engineering discipline = the sum of the product of weight factor for each document and the actual progress of each document in mechanical discipline for a particular project. Weight factor for pump data sheet is 0.0356 obtained based on 200 budgeted hours/ 5470 total budgeted hours of mechanical discipline. The progress data in “Quantity Progress (% complete)" column is referred to the document progress calculation based on work step completion and work step weight factor. This is the same calculation method used for a piping isometric drawing progress as explained on above. The progress data in "Weight Progress" which also known as physical progress column is referred to the progress calculation based on document weight and Quantity Progress (% Complete). 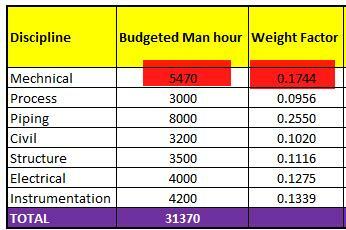 Finally, the total progress for mechanical engineering section, 37.8% is the sum of weight progress for each document. Progress calculation procedure for process, piping, civil, structure, electrical and instrumentation is done using the same methodology as mechanical discipline. Progress data for engineering phase can be obtained using the same exercise like discipline wise progress calculation. The difference is the way how you want to group it. That means weight factor for each engineering discipline is required to analyse the total progress of all disciplines.
. See the below formula to get overall engineering progress. 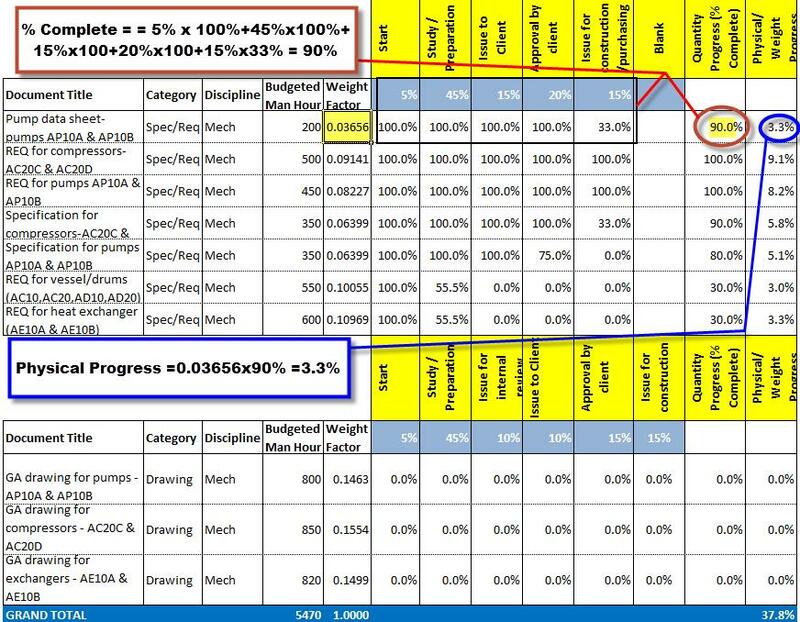 Progress for engineering phase/stage = the sum of the product of weight factor for each discipline and progress for each discipline, see how weight factor for each engineering discipline as below. Assuming that budgeted man hour for mechanical, process, piping, civil, structure, electrical and instrumentation are listed as table below. Mechanical engineering progress is 37.8 % as stated above and assuming that the individual progress for other disciplines is listed as below table. Download sample progress calculation sheet to learn more. For non-deliverables (considered LOE) can be planned as a fixed 10% of overall engineering estimated? As LOE activities can’t be measured objectively, the planned value is always same as earned value. Therefore, schedule variance is always Zero. It doesn't matter 10% or 20% when schedule variance is reported. The use of LOE (Level of Effort) should be avoided when engineering progress is evaluated so as to not distort overall engineering progress. Thanks for your comment. I have recently updated on this procedure. It has explained more details. I personally don't believe there should be any progress claimed for activities outside of the deliverables, i.e., client approval, meetings, etc. Those items are not in the scope of work. The scope of work should only include drawing, report submissions - once the are approved. Until they are approved, they have made zero progress on their deliverables. For drawings, I would suggest using the 30%, 65%, 90%, and 100% for each design package. Once the drawings are at 100% they are IFC'd. As far as the weighting of the individual tasks of the design packages, I believe 40% for 30% drawings, 30% for 65% drawings, 25% for 90% drawings, and 5% for 100% drawings. The reasoning behinds this weighting is the fact that the earliest design activities take the longest. Any subsequent activities only add to the previously approved parts. One thing to remember is to spot check because engineers like to claim more progress that the documents are progressed and every discipline uses different opinions on interpretation of earned rules of credit. Is there any way that a level of effort calculates the corresponding labor units and percent complete? When closing 100% for drawings, take into account that no hold should be in the IFC releases.